Sometimes your worst nightmares come true, such as having your home and belongings damaged by a flood? Can you imagine the mess? Can you imagine what cleanup from flood damage would entail? Need expert water damage restoration services? Immediate action prevents further deterioration and starts getting your life back to normal right away. We can be at your door anywhere in San Diego within in an hour, 24 hours a day 7 days a week. Reach out to our plumbing service experts at (619) 345-5550. We are fully committed to providing you with the plumbing services that you need in San Diego. Why Do You Need Water Damage Specialists? Whether a burst washing machine hose or flooding from a winter storm it’s amazing how much water soaks into the building. It even makes its way upwards inside walls (a foot or more above any water on the floor) and into the innermost structure. Getting there within just a few minutes, it takes weeks to evaporate. All during that time it’s causing progressive harm to wood, drywall, and more. And some of that damage can be completely hidden. Raising humidity, it can lead to mold in as little as 24 hours, damaging furniture and destroying textiles. That’s anytime and anywhere in San Diego, not just in the winter or near the coast. So what may not look serious may very well be a big problem. So for anything more than a small amount of water you need special water extraction and structural drying equipment to remove excess moisture from building materials as quickly as possible. Using a shop wet-vac or mopping up isn’t enough, nor are cleaning companies and ordinary general contractors. You need certified experts with all the right drying equipment. And your insurance coverage will most likely require that, as it’s the only route to assure that all necessary prevention and restoration steps have been taken and properly performed. Even though it’s a rushed and stressful situation, you need to check out any company you’re considering. Do they have the proper training, experience, and equipment? Are they licensed and insured? If not you’re likely to find yourself liable for any worker injury and disaster restoration damage. The flood damage restoration company should have a permanent local presence near San Diego so that you can have some confidence they’ll be around in the months and years to come. You can also gauge their professionalism by their membership in various cleaning and restoration industry organizations. Water damage may be a slow hidden progression such as from a small plumbing leak inside a wall, or sudden and substantial flooding. 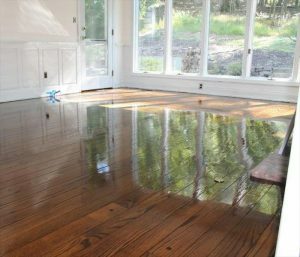 Following IICRC, CRC, and RIA guidelines our water damage restoration process is tailored to your specific situation, based primarily on the amount of water (Class 1, partial room with little wet carpet through Class 4, flooring soaked in several rooms, water wicking a foot or more up walls, and even hardwood and stonework saturated) as well as the degree of health hazard (Category 1, directly from drinking-water plumbing through Category 3, storm flooding and sewage backups. But the goal of our flood service is always the same: minimize the cost and time needed for water damage repairs by eliminating harmful levels of moisture as quickly as possible. Here’s an outline of how we use cutting edge technology and the latest industry best-practices. Immediate water removal. In cases of flood damage from natural causes a specialist’s attention to containment and isolation of water containing biohazards followed by extreme cleaning, disinfecting, and debris removal is an important part of this first step. Water extraction. Our unique truck-mounted extraction gear vacuums surface water out of floors, walls, and ceilings. It’s roughly twice as effective as the equipment used by carpet cleaners and outperforms most of our competitors, cutting a day or more off drying times. Building structural dry out. Several types of equipment such as refrigerant dehumidifiers, air movers, and turbo dryers are necessary to pull out every last bit of deeply-soaked dampness. Our specialists frequently monitor temperature and humidity, making adjustments for the most rapid drying and not stopping until excess moisture is down to safe levels. Our experts will also take care of cleaning and disinfecting regardless of the size or source of water damage. And as needed our water damage restoration services can include mold remediation. All combined, our state-of-the-art equipment, certified technicians, and decades of experience turn weeks of building drying under natural evaporation into typically just 3 to 4 days. Just knowing that is a big relief to many of our clients. Standard homeowner and business insurance policies almost universally exclude water damage repairs due to natural flooding. You need a special flood rider for that. They’re expensive, so many people choose FEMA’s NFIP (National Flood Insurance Plan, https://www.fema.gov/national-flood-insurance-program). Insurance coverage also excludes preventable damage, and that includes water damage repairs and mold removal that could have been avoided with immediate action from licensed services. Fortunately, the cost of those mitigation steps usually is covered. Having dealt with pretty much every major insurance company covering San Diego County for two decades, we’ll know exactly what mitigation actions are necessary and exactly what detailed documentation is expected for a smooth insurance claims process. We’ll provide that through email and web communications, including digital photos, for ongoing communications and faster processing. At Plumbing and Drains Solutions we understand the kind of stress you would be under in this sort of a situation, which is why you can rely on us to take care of all your flood restoration and water damage concerns. Worrying about possible flooding is not something you want to be worrying about, and knowing that we are here for you, you can breathe a sigh of relief that there is one less thing you have to worry about. If the unthinkable should happen, our expert restoration technicians will be there as quickly as possible, taking care of everything that would need to be done, such as flood repair, removing mold and drying out your floors. With cutting edge technology, our restoration technicians will be able to have you dry in no time, and our restoration team holds all the certifications necessary to complete the job as outlined by county regulations. As a team that is dedicated to easing your troubles with our water, sewer, and gas line services, you can trust Plumbing and Drains Solutions. Call (619) 345-5550 to contact us at any time. We are the best, top rated water damage restoration service company in San Diego, including North, South, West, Coastal and East County. We don’t offer deals or specials since our pricing is based on the insurance adjuster damage assessment. Most importantly we have reasonable rates for cash paying customers and our prices that reflect our professional damage restoration contractor services. Are you looking for an affordable, licensed, bonded and insured water damage restoration service “near me” or “in my area” to clean up and extract water or fix your leaky water plumbing issues in your apartment, high rise or upper level condo / condominium, residential home / house, or vacation rental if is has flooded? If so, we are an emergency water extraction service ready to stop that water leak. We also do flood remediation services for commercial properties, H.O.A. Home Owner Associations and work with real estate property managers and investors. We are not cheap flood remediation contractors but rather a water damage restoration contractor with even better rates and fast response times. Our service is highly rated and we can do any type of repair on the following: residential and commercial water damage flood remediation. Our flood service technicians are highly trained certified. We carry all necessary equipment and supplies to do the job right the first time. Are you looking for a 24 Hour emergency flood water damage extraction and removal company? In this type of emergency, you might have water damage and need someone fast. We can help shut off any leaky pipes or water lines. Our customers love us based on the many positive reviews we have in Google, Yelp and Facebook. Book online or call us today to schedule a free estimate appointment.